The Midnight Freemasons: Is Freemasonry A Religion? In almost all religions, legends or traditions of civilizations of eras long ago there is always one similarity: the ideology of death & rebirth. Mayans: They had many rituals that revolved around death. The dead were laid to rest with maize in their mouth as a symbol of rebirth and food for the journey to the otherworld. Similarly, a stone bead was placed in the mouth which served as currency for this journey. Celts/Druidism: Believed in rebirth and transmigration. Ancient Greek: Plato presented accounts of reincarnation, particularly the Myth of Er. Early Roman/Pagan: Easter is a symbolic story of the death of the son (sun) on a cross (the constellation of the Southern Cross) and his rebirth, overcoming the powers of darkness. The Easter Bunny comes from the Goddess, Eostre, whose symbol was a rabbit due to the fertility and rapid reproduction. Judaism: According to the Torah, the Jewish people are descendants of Abraham and one day the “Messiah” will return to lead them back into the holy land. According to the prophecy, this Messiah will be betrayed, put to death and reborn. Christianity: Believes that Jesus was the “Messiah” who was betrayed, put to death and was reborn. Jainism: Holds the achievement of spiritual freedom or reincarnation, as its main purpose. Jains can achieve freedom from their material existence, or karma. Hinduism: By following the right paths, they may be released from rebirth and achieve “moksha” or reincarnation. Egyptian: Believe that a person's life would continue even after death is evident by the many temples or pyramids. They also have the story of a murdered King (Osiris) that is risen from the dead, or reborn, by his wife (Isis). Buddhists: Believe in reincarnation, karma and the idea of achieving complete liberation, or Nirvana. Similar to this is Taoism and Confucianism. Sumerian: The Goddess Ishtar was hung naked on a stake, and was subsequently resurrected and ascended from the underworld. Then, with this as background information, look at the initiation experience that one journey’s through in Freemasonry. Do we not have a similar story? Do we not have rituals that deal with life, death and rebirth? Although we do not allow the profession of one religion over another, we certainly do have similarities with most if not all of them. The way we, as Speculative Masons, are instructed to use the tools of the Operative Mason, we can bridge the basic tenants of just about every religion that I can think of, past or present. Perhaps the basis of the origin of our Craft was to create something that would show the world that it is indeed possible to live by the tenants of your religion and have a place or manner in which to gather. 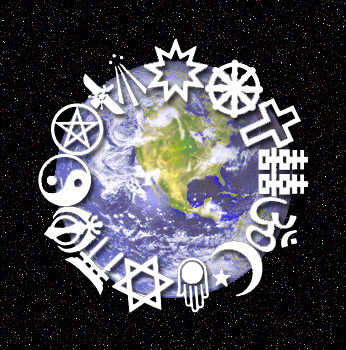 Wherein everyone is accepted, regardless of the name by which they call their Deity. Bro. Brian Schimian is Life of Member A.O. Fay #676 in Highland Park Illinois and the Medinah Shriners - Lake County Shrine Club. He was also the Past Master Counselor of DeMolay - Lakes Chapter in 1995. Brian is a father of two children. "Start Square, Finish Level". Thankyou for this post. I am endlessly fascinated on how we as individuals use language and even what official dictionary we use to instill our internal meanings of words. While I am not a Mason, I have spent endless hours appreciating what Masonic mythology and ritual are aiming for. In fact, my parents raised me a Roman Catholic. There too, and central to the Catholic ritual is life, death and rebirth. For a long time I tried to understand the Priest holding the Host with arms outstretched just before it is broken in half. The two half circles of Host are then held again to align as the vesica piscis. Can the classical mathematics and geometry between this new intersection that represents two new circles be seen as some allegory of rebirth? I have decided to try and stop using the word 'religion' because it only seems to shut down most people who come to the discussion prepared with their own idea of what religion is and where allegory and metaphor begin. I spent many an hour learning about masons, and then past by stone masonry and it was truly a sight to behold. Like a jensaw puzzle, these masonic men put together such a fabulous and intricate maze of stone- Can the classical mathematics and geometry between this new intersection that represents two new circles be seen as some allegory of rebirth? I think this quote from your post nails it ! Masons still believe in the perfection of architecture and the like! Just knock three times on the ceiling if you want me. Thank you so much for all the great masonic sites. I am enjoying them immensely! I just enjoyed your podcast concerning King Solomon's temple. I realize that you must start at the beginning in order to teach the ultimate truth of masonry. I believe your comment on Judaism was taken from a Christian source. We are still waiting for the Messiah. He hasn't come yet so he will not return. He will be a man, of the house of Judah. He will bring the exiles back to Israel and will usher in the Messianic Age which includes there being no more death. So there will be no need for him to be reborn. Otherwise and interesting piece.